On New Years’ day there was a signboard, a few cards in my mailbox (including a 10,000 bell bag from “Mom”), and Isabelle gave a cool zodiac horse for the occasion. 🙂 The new year has been here for months in real life, but this is the first new year in Citàlune — I hope 2014’s good to it! Just thought this was a nice shot, showing the flowers I have lining the riverbank. And it was a koi! I completed the fossil exhibit in the museum, but Blathers didn’t have a whole lot to say about it. 😦 I miss blathering Blathers. Yay, a flower fan! Finally a rumor that I really like and think fits me well, but I went back to being a pro-listener as usual a few days later. 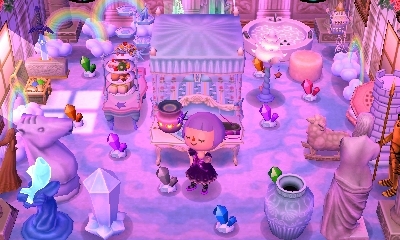 😛 I think the flower fan rumor started after I updated my dream address early in January, because before I updated I went around and watered all the flowers in town so that they would sparkle in the night (and I have a lot of flowers!). Pondering the dimensions before building my first snowman in Citàlune. It took me a while to build one because of general laziness, I guess, and because it’s hard to push a snowball around my town without breaking it, and because I didn’t even know where I’d put a snowman! But then I remembered this empty spot below Estel’s castle gardens, where I plan to put two benches eventually, but for now it’s perfect for having some snowmen/snowpeople! Mitzi letting me know her plans to move. I’ve enjoyed having a cute kitty in town, but she’s not a dream neighbor, so I decided to wish her well in her plans. Haha, this made me laugh since I have long hair in real life. xD None of the haircuts in AC are that long, but Gloria still seemed quite concerned! I messed up majorly when plot resetting for his house. 😦 It was pretty late at night and I was tired, hoping that it wouldn’t be too much longer before his house landed where I wanted it to, and I was reading some stuff online while resetting to make it a bit less boring. Before I knew it, instead of the sound of the train and talking to Rover, I heard the sound of Isabelle starting up the game for me. I wanted to stop it so bad, but realized that a corrupted game file would be a lot worse than a house plot in a bad location, so I had to let it finish. T_T I’ll let this be a warning to myself (and others, if other plot-resetters are reading this) to not get too comfortable and confident when resetting, always be careful and alert and patient, and try not to do it when you’re too tired. I even had a PWP set up two spaces away, to guide the house to go in the exact space I wanted it to, but the plot didn’t go anywhere near here after two hours. It was Colton who hosted my surprise party, and Rod and Melba were there as well! 😀 These three are some of the residents who have been in my town the longest, so I guess maybe that’s why? Colton putting the charm on. They were all just singing away, hehe, Melba looked so adorable! Erik officially moved in on my birthday, what a great birthday present ._. His cabin could’ve looked so lovely in the right part of town, but it looks awfully out of place here right next to Estel’s castle gardens, and it’s inconveniently in the middle of a path. Lastly, I’m not sure if it was a coincidence, but K.K. Slider happened to be playing K.K. Birthday when I walked into Club lol! 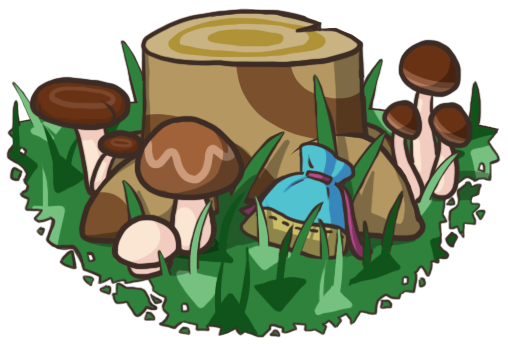 Posted on April 2, 2014 by Amy •	This entry was posted in AC:NL, Citalune and tagged Animal Crossing. Bookmark the permalink. If you have a moving villager, do you ever post it on an adoption site? Oh I’m sorry about that 😦 It wouldn’t have been a bad idea for me to specify which neighbors I planned on being permanent or not, so that people who read my blog could “reserve” them. But it would be too late for a policy change to do much good now, since I’ve got 8/10 dream neighbors. Aww, that’s a bummer! 😦 Yeah, I’ve heard that some people even use the method of making a new character to easily and cheaply demolish PWPs (since you don’t have to pay for it, and it’s immediate). 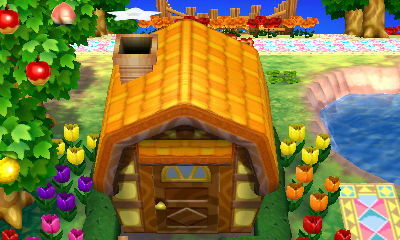 I’m glad to hear you find the villager house exterior guide useful, and that you’re enjoying spring in your town! 🙂 I’m still enjoying winter but I guess I’ll get to spring eventually! I got a birthday cake when it was my birthday in ACNL, but the hat is really cute! 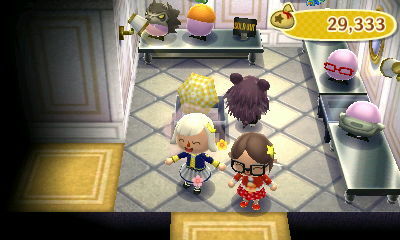 Mallary escorted me to her house, and I think Jacques and Mira must’ve been there for my birthday (it’s been five months, though, so I kind of forget who was there) 😛 I’m pretty sure it’s the three villagers you have the highest friendship ranking with! Yeah, I just haven’t had good luck with villagers in general lately 😆 I hope so, too! Hmm, the birthday cake is pretty extravagant, but even if you don’t get it with Violet, I think there’s a chocolate cake on Valentine’s Day you could maybe use? I don’t know where you’re planning on putting it (personally I would say the chocolate cake looks a little more like something Violet might have, since it’s pretty simplistic? ), though, so I guess we’ll have to wait and see! Congrats on completing your fossil exhibit and getting a real valiant statue! ^^ I still find it kinda sad how much they stripped back Blathers’ character 😦 I understand their reasoning for removing most of his dialogue and putting it in the exhibits instead, but it was so much more fun hearing about all the donations from Blathers himself. Lol, apparently I’m a ‘stump maker’ now. Well that’s what you get for trying to beautify your town for the cherry blossoms! Ugh, when I read how you accidentally loaded Estel’s file I thought it most likely meant you had to sit through the loading process knowing full well you had made a mistake. You deserve a prize for having the clearheadedness not to shut it off. But good luck with Doc this time round! Btw the picture outside his house (is that in your other town?) looks awesome. Ooh, happy in-game birthday! It’s cool that Melba was able to attend ^^ Haha it’s funny that it’s just a picture of your game character up on the screen in Club LOL, but it still feels embarassing xP Did K.K. Slider play the birthday song for you on the Saturday? Thanks! 🙂 I agree, I liked hearing about the donations from Blathers with his cute unique style of dialog (“hoo!”), and to me it was kind of like a reward for donating the item to hear more about it from him… it would’ve been a good idea imo to keep both the dialog from Blathers, along with the (more permanent, and less biased against bugs, etc.) descriptions in the museum exhibits. Hehe I’ve been a stumpmaker before too, when cutting a bunch of trees down 😛 I try to do a few errands for my neighbors every day so I guess it’s inevitable that I’ll always go back to being a pro-listener, though. Thanks Teru! 🙂 Ahh I forgot about that, I'm so bad about remembering to go see K.K. Slider, especially now that you can buy songs at the store (and because during my TT-catch-up process I don't pay attention to the days of the week much). I'll have to really try hard to remember with Violet's birthday next month! Haha yeah, I’ve heard of that one! I’ve actually never gotten the time-traveller rumor in my TT-catch-up process, I guess because I do enough things each day to get other rumors about me instead. It’s the same for me 😦 I guess it might take me a long time (if ever) to get the K.K. badge & his picture. I couldn’t agree more with the Blathers thing. I completed both the fossil and bug exhibits and he was just like “oh, thanks” and that made me nostalgic. 😦 Also, I wanted so badly for him to freak out and be like, “ZOMG YOU CAUGHT A COELACANTH, GOOD FOR YOU! !1!11” but he just gave me the reminds-him-of-a-moment-in-his-mother’s-nest spiel. I agree, I miss it! 😦 I think it’s a bummer that they probably did it as an improvement, thinking that people didn’t want to sit through as much dialog, but it took away from his character and many old-time players from past games appreciated his character. Haha yeah I didn’t expect to see a reference to that in AC 😛 Guess they couldn’t think of another “string” pun.